Chris poses with the K12 educators of tomorrow – young professionals who are eager to incorporate digital design and fabrication into the classroom. 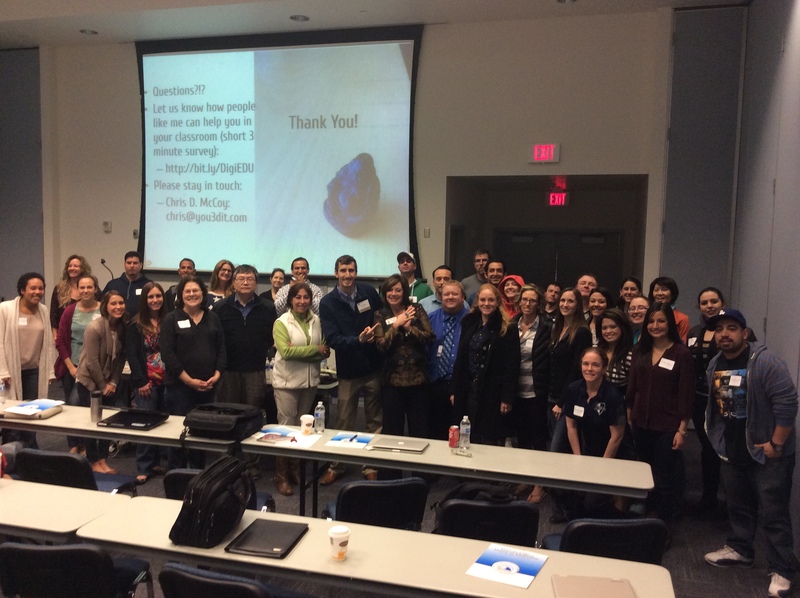 On Saturday, January 24, 2015, Chris had the privilege to present on behalf of You3Dit Inc to the Ventura County Office of Education and their newly credentialed K12 teaching staff. Competing with about 7 other seminars at the same time, we packed Salon B with about 60x educators who were eager to learn more about digital fabrication technologies like 3D printing, laser cutting and desktop CNC. In addition, Chris also presented on the Rapid Innovation Cycle (as developed by Hands-on Rapid Innovation) as a method for driving linked- and project-based learning activities for students. This process enables students to quickly develop market tests where prototypes are preferred over ideas and data generated from real market feedback helps drive the business decisions in both entrepreneurial and educational environments. A HUGE THANKS goes out to Mr. Mark Urwick, Robert Hochberg and Jacquelyn Lozano for all their help and facilitation throughout the day. Chris earned his Ph.D. degree in mechanical engineering at the University of California, Berkeley. In addition to conducting research on small-scale fuel-flexible engines, he also completed the Management of Technology Program (MOT) at the Haas School of Business and received his Masters Degree in Mechanical Engineering Design; both from U.C. Berkeley. Most recently, Chris left his consulting role at a large utility company to bring to life a startup initiative, You3Dit Inc, which aims to enable anyone to quickly get involved rapid prototyping and design.